The hardware encryption market is expected to have a high growth during the forecast period. The overall market is expected to be valued at USD 413.85 Billion by 2022 from USD 58.46 Billion in 2015, at a CAGR of 29.3% between 2016 and 2022 The base year considered for the study is 2015 and the forecast period provided is between 2016 and 2022. The objective of the report is to provide a detailed analysis of the market based on algorithm & standard, architectures, products, application, verticals, and geography; information regarding the major factors influencing the growth of the market (drivers, restraints, opportunities, and industry-specific challenges); and detailed value chain and Porter’s five forces analysis. In addition, its objective is to strategically profile the key players and comprehensively analyze their market rank and core competencies, along with detailing the competitive landscape for market player, and new product launches, acquisitions, partnerships, expansion, agreement, contract, alliance and collaboration in the hardware encryption market. The research methodology used to estimate and forecast the size of the hardware encryption market begins with obtaining data on key vendor revenues through secondary research. Some of the secondary sources used in this research include information from various journals and databases such as IEEE journals, Factiva, Hoover’s, and OneSource. The vendor offerings have also been taken into consideration to determine the market segmentation. The bottom-up procedure has been employed to arrive at the overall market size of the hardware encryption market from the revenue of the key players in the market. This data triangulation and market breakdown procedures have been employed to complete the overall market engineering process and arrive at the exact statistics for all segments and subsegments. The analysis of the hardware encryption market includes extensive primary research to gather information and verify and validate the critical conclusions arrived at after an extensive secondary research. The hardware encryption ecosystem comprises hardware encryption manufacturers such as Western Digital Corp. (U.S.), Samsung Electronics Co. Ltd. (South Korea), Seagate Technology PLC (Ireland), Kingston Technology Corp. (U.S.), Micron Technology Inc. (U.S.), Toshiba Corp. (Japan), Kanguru Solutions (U.S.), Maxim Integrated Products, Inc. (U.S.), NetApp (U.S.), WinMagic Inc. (U.S.), Thales e-security (U.S.), and Gemalto NV. (Netherlands). This report segments the hardware encryption market on the basis of algorithm and standard, architecture, products, application, vertical, and geography. The hardware encryption market for advanced encryption standard (AES) is expected to witness a significant growth during the forecast period. The significant growth of this segment can be attributed to the wide acceptance of AES as a highly secure and fast algorithm for encryption. The application-specific integrated circuit (ASIC) accounted the largest share of the hardware encryption market in 2015. The growth of this market can be attributed to the huge demand for the processor based on ASIC design for the manufacturing of hardware-encrypted hard disk drives and USB drives, owing to their high speed and small form factor. The solid- state drive market for product segment is expected to grow at the highest rate between 2016 and 2022. Solid-state drive provides faster encryption compared to the hard disk drive devices; with the increasing data breaches and expansion of digital content the market for solid-state drive is expected to grow faster than the other products. The hardware encryption market for consumer electronics is expected to hold the largest share during the forecast period. This can be attributed to the growing demand of hardware encryption in consumer electronics such as laptop, tablets, and smartphones and also due to increasing concern for the data security in these devices. The hardware encryption market for government vertical is expected to grow at the highest rate between 2016 and 2022. This can be attributed to the increasing demand for high-level encryption solutions required to secure top-secret government data in countries across the globe. Americas accounted for the largest share of the overall hardware encryption market in 2015. This can be attributed to the large number of automation projects, smart cities projects, huge defense expenditure, advanced healthcare facilities, connected living environment, and huge reliance on e-commerce in the region. Huge capital investment required in the installation and maintenance of hardware-based encryption technology are the key restraining factor for the growth of the hardware encryption market. Total installation cost of hardware encryption technology includes licensing cost, annual maintenance cost, OPAL fees, pre-provisioning cost, staging cost, technical cost for password reset, user idle time cost for encryption, user excess operating cost, technical cost for the assistance of expert administration to encrypted drives. 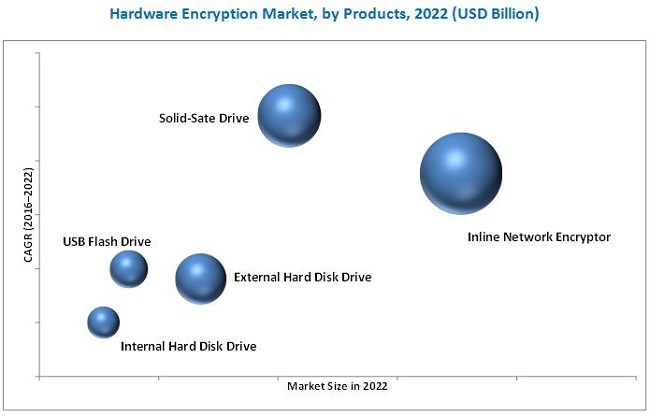 The key players in the hardware encryption market include Western Digital Corp. (U.S.), Samsung Electronics Co. Ltd. (South Korea), Seagate Technology PLC (Ireland), Micron Technology Inc. (U.S.), and Kingston Technology Corp. (U.S.), Toshiba Corp. (Japan), Kanguru Solutions (U.S.), Maxim Integrated Products, Inc. (U.S.), NetApp (U.S.), WinMagic Inc. (U.S.), Thales e-security (U.S.), and Gemalto NV. (The Netherlands). These players adopted various strategies such as new product launches, acquisitions, partnerships, expansion, agreement, contract, alliance and collaboration to grow in the market. 14.3 Samsung Electronics Co. Ltd.
14.10 Maxim Integrated Products, Inc.